Three generations of the Morris family have now made barbecue their business. The Gaston County clan’s latest venture is Ole Carolina BBQ, a new name with a familiar sound and a familiar flavor. 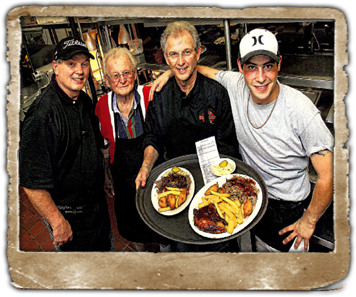 David Morris and his three sons, Wesley, Mark, and Norman originally ran Carolina Country BBQ on Union Road in Gastonia. In the summer of 2011 family members jumped into the eatery industry again with a restaurant just a few doors down from the original location. Their menu, the same one they used at the longstanding Carolina Country, is back. So are brothers Mark and Wesley, dad David with his famous sauce and one new face among the family full-timers. Wesley’s sons, Tyler and Matt are now confronting the restaurant kitchen. The first two generations of Morris’ settled on barbecue business 36 years ago, when David Morris’ three sons decided they wanted to start a company. Carolina Country BBQ stayed in the family for 25 years and spawned three franchises.